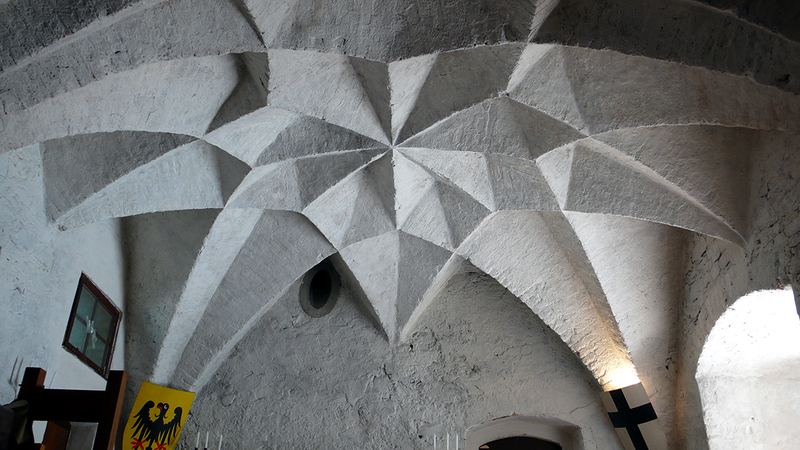 Late Gothic diamond vault with stellar figuration in the castle of Trebsen: Here, in two vaults the masonry texture could be surveyed, while it is usually covered by plaster. Diamond vaults are mostly built in brick, and in many cases there are no stone ribs. The so-called Diamond Vaults (or „cell vaults“) are a particular type of late Gothic vaults, which are characterized by their folded surface with ridges between the groins, creating ceilings with pronounced patterns of light and shadow. The construction material (apart from few exceptions) is brick masonry. Their invention is associated with the construction of the Albrechtsburg, the new palace for the princes of Saxony in Meissen, which started in 1471 and was designed by Arnold von Westfalen. In the following decades, Diamond Vaults became very popular all over central and eastern Europe, and were used as ceilings in palaces, churches, and private houses. Historical sources give no information about the motives for their invention and popularity, and neither on their construction technique. In the project, the principles of their design and construction were studied on selected examples, achieving also to resume their construction process. This was achieved on the basis of geometric analyses of the shape and masonry texture of the surveyed vaults, in connection with practical experiments, where parts of these vaults were reconstructed in full scale with original materials. The recovered knowledge on the construction of Diamond Vaults can now serve as a basis for their conservation and restoration. Moreover, it is possible to understand their peculiar shape. Also, conclusions can be drawn on the building organization, and on the design process and its underlying criteria. The geometric properties give evidence on which aspects were subject to architectural design and which aspects were left to the hands of the executing craftsmen, and also how the information was transmitted from the design to execution on the building site. The analyses, experiments, and source studies also gave way to reconstruct the centering system of Diamond Vaults. Together with the conclusions on design principles, also the reconstruction of the centering is of general relevance for late Gothic vault construction. A reconstruction of the centering including a sample piece of vault masonry “under construction” in full scale, as well as scale models showing the construction phases, are presented in the permanent exhibition in the Albrechtsburg Meissen, introducing to the general public how these vaults were designed and built, and how this determined their appearance. In the exhibition, also a video about the experiments is shown. David Wendland, Christian Mai, María José Ventas Sierra. Practical experiments in collaboration with Förderverein Handwerk und Denkmalpflege Trebsen: Uwe Bielefeld, Bernd Bubnick, Hans-A. Gasch, Robert Bialek, Jörg Frenkel, and partecipants in courses in restoration. D. Wendland: “Cell vaults – Research on Construction and Design Principles of a Unique Late-Mediaeval Vault Typology.” In Proceedings of the Third International Congress on Construction History, Cottbus 2009, v. 3 p. 1501-08. D. Wendland: “Wölbkunst der Gotik: Untersuchungen zu den Konstruktions- und Entwurfsprinzipien der spätgotischen ‘Zellengewölbe’.” In G. Zumpe (ed. ), George-Bähr-Forum Jahrbuch 2009, p. 160-167. Dresden 2010. D. Wendland: „Befunde und Experimente zur Konstruktion von spätgotischen Zellengewölben.“ In G. Zumpe (Hg. ), George-Bähr-Forum Jahrbuch 2010/11, p. 134-139. Dresden 2012. D. Wendland: “Untersuchungen zu den Entwurfs- und Konstruktionsprinzipien der spätgotischen Zellengewölbe: Ein neuer Ansatz in der Verknüpfung von geometrischen Analysen am Befund und experimenteller Archäologie.” In Staatliche Schlösser, Burgen und Gärten Sachsen Jahrbuch 2010/2011, p. 23-33. Dresden: Sandstein Verlag, 2012. D. Wendland: “Form, Konstruktions- und Entwurfsprinzipien von spätgotischen Zellengewölben – ‚reverse engineering‘ und experimentelle Archäologie.” In Koldewey-Gesellschaft, Bericht über die 46. Tagung für Ausgrabungswissenschaft und Bauforschung Konstanz 2010, ed. K. Tragbar, p. 255-266. Dresden: Thelem, 2012.